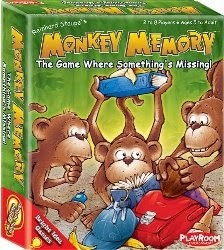 Monkey Memory - get it here! ﻿﻿﻿﻿﻿I have another great game by Playroom Entertainment up for review (three more to follow! ): Monkey Memory! This card game relies on students' recall of visual information, which makes it a great activity for individuals who are trying to hone their short term memory skills. Monkey memory is quick and easy to learn, and consists of sturdy and durable cards (always a plus when playing card games with children!). The recommended number of players is 2-8 and the age range is 5 and up. Players take turns being the dealer, with the oldest going first. The dealer turns over a card from the second stack one at a time, covering the last revealed card as the other players watch. The last card - the mystery card - is NOT revealed. 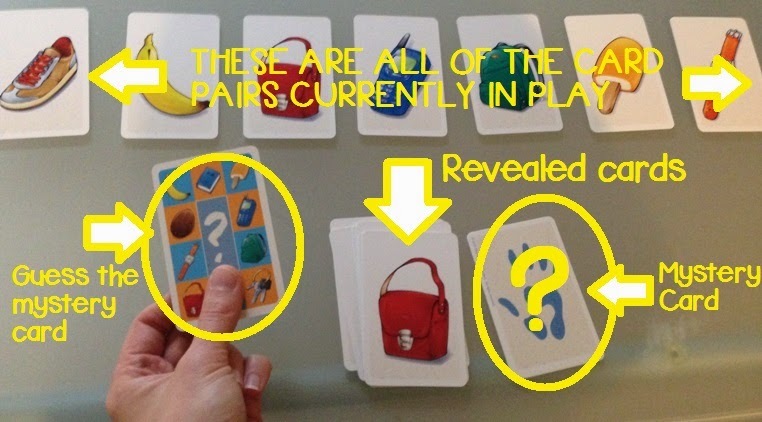 Players have to rely on their memory to determine which object has not been revealed and use their thumb to cover the item on the solution card. Players who guess correctly, get a point (point cards are included in this game, as well). After each turn, another player becomes the dealer and chooses seven new pairs of object cards. You can modify the difficulty of this game by deciding how many card pairs you will be using. This game would be a fun activity to use with students who are learning to utilize memory strategies (e.g., subvocalization, visualization, etc. )!